MJSL champions Liverpool Haroldeans are on course for a domestic treble after lifting the Joan Collins Premier Division title. Haroldeans completed their league campaign with a 3-1 win against Maccabi Manchester Blue at Brooklands. Top scorer Adam Shiffman (2) and James Harris struck the goals for the runaway champs who suffered only one league defeat. Charlie Simpson scored Maccabi’s goal. Haroldeans finished 12 points clear of runners up Reich Insurance Rangers White. “Some of the football we’ve played this season has been exceptional and we’ve had some outstanding results,” said Haroldeans boss Mike Bloomberg. “A year ago we were struggling for numbers so it’s a superb achievement. “The squad have been fantastic from word go and the young lads have been unbelievable. They’ve turned up to every training session. We can only take 16 to games but no one has complained if they have been left out. The Merseyside team has now set their sights on landing two further trophies. Standing in their way of success in both cup competitions is Leeds Maccabi who had to overcome a torrid pre-season to rebuild a competitive squad. Adam Kristall’s charges ended the league season in a creditable third place. Haroldeans and Leeds met once in the regular season with the Liverpool-based side enjoying a 6-2 win. Haroldeans are hot favourites to win the Harold Feldman Trophy at West Didsbury & Chorlton FC on Sunday and Fay & Henry Shonn Trophy at Salford FC on May 21. Neither side has major injury doubts ahead of the first clash. “Leeds were in a similar position to ourselves and had to bring young lads in,” Bloomberg said. “From what I’ve seen they have improved as the season has gone on. “We won our game in the league but the final result did not reflect the match overall because they lost their goalkeeper through injury early on. “We were going to call it a day but a number of 16- and 17-year-olds came in and we’ve progressed rapidly,” said Kristall. “As a club we are very excited because a lot of these young players have never played in a cup final before. They’ve come in and done very well. “Haroldeans are a very good side and won the league comfortably. This weekend sees Redbridge Jewish Care A attempt to clinch the Maccabi GBSFL Premier Division title with a win at Hendon United Sports A. A victory will see the Essex side overhaul current leaders Oakwood A by a point. Jon Jacobs’ team defeated North London Raiders A 4-2 in their latest encounter last Sunday. Ben Sollosi, Steve Summers and Sam Sollossi scored for the title favourites. “It was a workmanlike performance and deserved victory, which leaves us one more game to get the job done,” said Redbridge boss Jon Jacobs. Looking ahead to the crucial fixture against third-placed Hendon, he commented, “There are nerves because everyone knows the importance of this match. 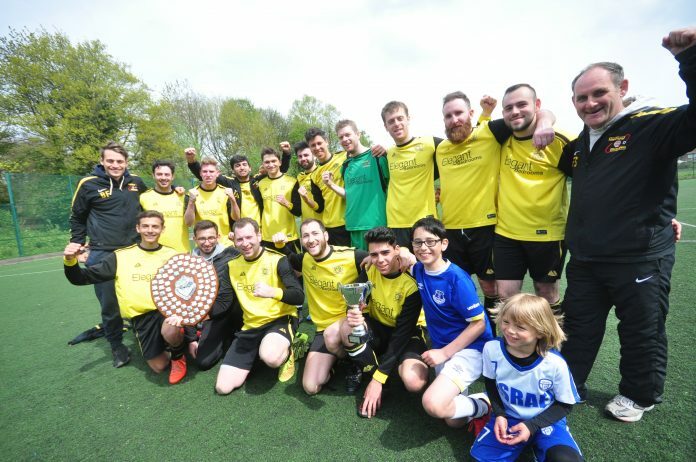 Elsewhere, Athletic Bilbaum forfeited their final match against Division One champions Redbridge Jewish Care B.
Finchley City edged a seven-goal thriller 4-3 against Oakwood B with Sam Cantor scoring twice for the victors. In Division 2, Avi Markiewicz and Jonti Aremband notched a brace apiece in a 7-0 rout for RC UK FC at Hertswood Vale. Avi Levy, Zalmy Cohen and Akiva Solomon also scored.